Who Is Eugene Charles DC, DIBAK? 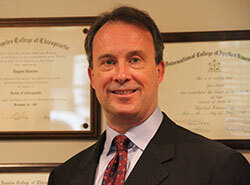 Dr. Charles graduated from LACC 1987 and earned his diplomate in Applied Kinesiology in 1994. Since he began sharing his knowledge, Dr. Charles has gone on to certify more doctors in Applied Kinesiology than any other teacher. By mixing a direct and “in the trenches” style of teaching, drawing directly from his own experience, along with the mental and spiritual aspects of treatment, Dr. Charles has built a following around the world. His video teaching the 3 daily exercises that chiropractors must do for more accurate and effective adjustments has been seen by thousands of chiropractors in North America alone. You can watch it here. Doctors who learn from Dr. Charles are able to quickly and practically improve their skills in patient diagnosis and treatment by implementing the pragmatic and clearly-explained techniques. To learn more about how Dr. Charles can help you, visit the product catalogue here.